↑ Richard A Fletcher, Moorish Spain (University of California Press, 2006), pp.1,19. ↑ Ross Brann, "The Moors? ", Andalusia, New York University. 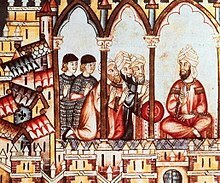 Quote: "Andalusi Arabic sources, as opposed to later Mudéjar and Morisco sources in Aljamiado and medieval Spanish texts, neither refer to individuals as Moors nor recognize any such group, community or culture." ↑ οἰκοῦσι δ᾽ ἐνταῦθα Μαυρούσιοι μὲν ὑπὸ τῶν Ἑλλήνων λεγόμενοι, Μαῦροι δ᾽ ὑπὸ τῶν Ῥωμαίων καὶ τῶν ἐπιχωρίων "Here dwell a people called by the Greeks Maurusii, and by the Romans and the natives Mauri" Strabo, Geographica 17.3.2. Lewis and Short, Latin Dictionary, 1879 s.v. "Mauri"
↑ Cornelius Tacitus, Arthur Murphy, The Historical Annals of Cornelius Tacitus: With Supplements, Volume 1 (D. Neall, 1829 ) p114.